When they turned four last month, Two Birds held a party at their Nest in Spotswood. There was cake. There was beer. And there was cake beer. 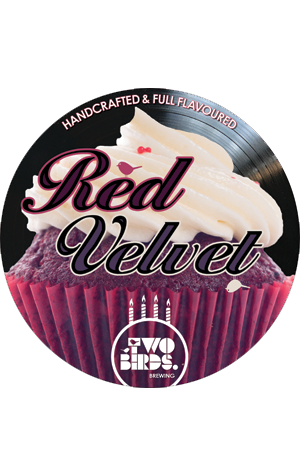 Yes, they marked the milestone as only brewers can by combining the two as one to create Red Velvet, a beer inspired by their favourite spongey treat – that richest and sweetest and reddest of cakes. The base beer is a malty red ale upon which was lavished organic cocoa and vanilla to boost its cakey credentials. They served it with a fluffy white nitro head to recreate the look of icing too. According to the Birds, it's "malty, rich and sweet – stick a candle in it and enjoy it!" Something you can do for a limited time as kegs have been sent across Melbourne and Sydney (and one to NZ).